Obsessively Stitching: Girly I-Spy Ticker Tape -- FINISHED! Girly I-Spy Ticker Tape -- FINISHED! After a loooong break from working on this quilt (other obsessions crept in! ), I finally revisited it and finished it night before last. Yesterday I sent it through the wash a couple times, trimmed off the extra hairy threads, and resewed the edges of a couple squares that frayed beyond the stitching. I love the fun, girly backing and bright binding. And THIS, my friends, is the pile of threads that came out of the wash! Amazing! I love it!!! 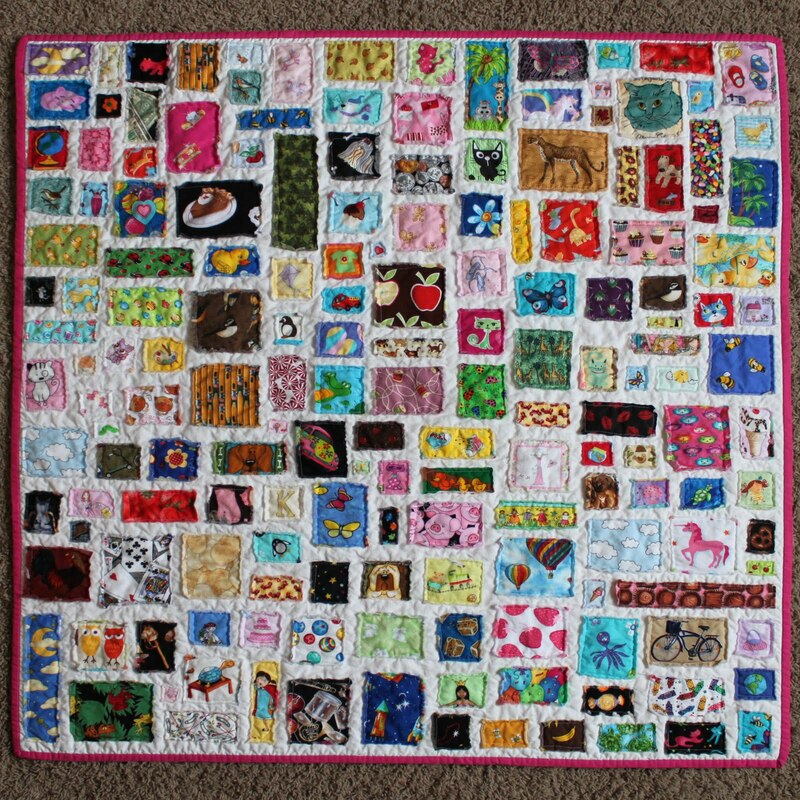 I was just telling someone this morning that I think I'm going to this sort of quilt with my I-spy squares & had the hardest time finding your first post about it. I LOVE this, Care! I am definitely going to make one someday! Love how the quilt crinkled up. Great job! What a fun quilt!! I'm sure that there are a few birds who would love that string ball to make themselves a nice bird mansion! LOL! That is really cute. I love it! Did you have a post with directions (or link to directions) that I have missed? Look at all of those threads, that is crazy. I saw you have an i-spy stack in your Etsy shop!!! That's so fun! love it. i really want to try one of these. love love this care! and the threads, holy moly! I linked to my first post about it, which linked to the original source -- but my links are hard to see! Hope you'll try it! It's SO fun!! I've GOT to try one of those! It looks so fun! Love it!! I have been saving all of my little scraps so that I can make one of these someday! I think I might do it soon though, the scraps are just piling up! that is so stinking cute! I love it! SO fabulous! Did you do quilt as you go on this one? This came out beautifully!! I am such a sucker for ticker tapes... especially when they involve i-spy too!! Very well done -- oh and I adore your binding!! wow that's one enormous ball of fuzz! love the quilt Care! That looks amazing! I knew there was a reason to save little scraps of fabric! I would love to make one of these some day. I hadn't heard of a ticker tape quilt before but I love this one! I'm waiting to get my I-Spy squares back from this swap, I may just try this! I am seriously coveting this quilt.